Its another terrific Tuesday and time for 2 For Tuesday and 2 more fantastic products discounted just for you. As much as I hate to say it..but in awhile school will be starting again. Have YOU been working on school items? I have been thinking about things that will be needed to get started for a new year. with teaching the kids the routines you expect them to perform. For instance, teaching morning routines of what you expect when they arrive at school or get into the classroom. With kids with disabilities, it isn't just a matter of telling them what you want them to do. 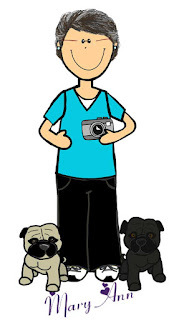 Sometimes the students will learn better if you use visuals with pictures to show them what you want them to do. A couple of ideas I have used and found particularly useful is a picture schedule or picture word schedule depending on if your student can read or not. Sometimes pictures are more understandable by some children. An example might be like the ones to the left. 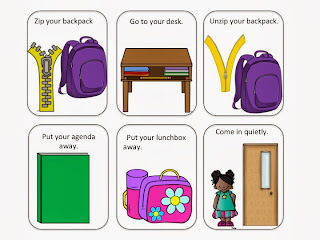 You'll notice that I have included pictures and words for very minute steps in arriving in class I want this child to complete. These visuals include zipping and unzipping the backpack and going to their desk. I cut these pieces apart and put them on a schedule board in the order I want them completed. Another time of the day I frequently use visuals at the very beginning of the school year is for teaching what behaviors are appropriate when arriving at school in the morning. 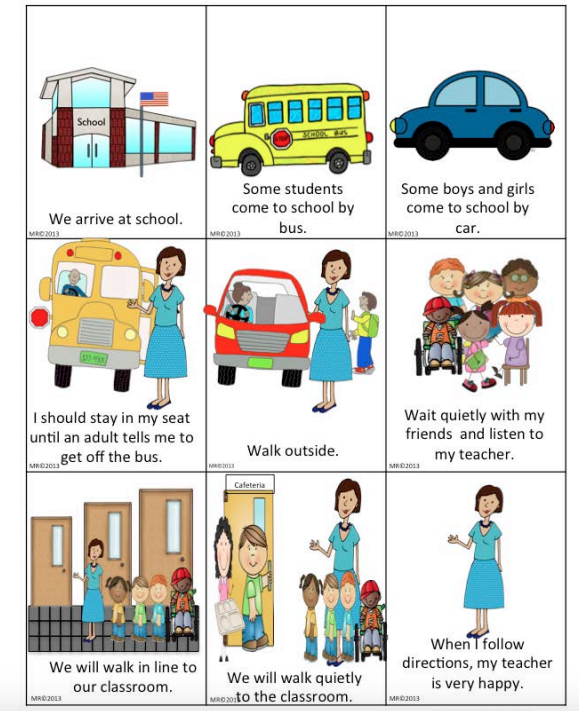 What should the student do when they get off the bus or out of the car? When students don't know what they are supposed to do, it can add stress and anxiety to the child's day and can increase inappropriate behaviors in some instances. 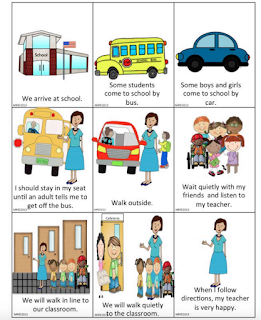 To the left, you will see an example of visuals for arriving at school telling the child some steps such as walking when the exit a bus or car and that they should wait quietly and listen to the teacher. Teaching, reinforcing, reteaching and reinforcing is of course needed to make the visuals work but these are awesome tools for teaching beginning of the school tasks. Today for 2 for Tuesday's please visit my store for 2 great items for you. Thanks for checking in! 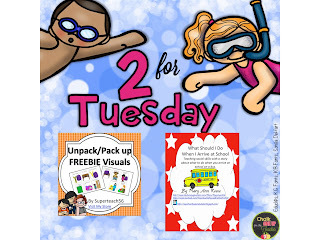 Be sure to stop by check in at Chalk One Up for the Teacher to catch other great 2 for Tuesday offers. Thanks for stopping by! I am glad you like them!